Michigan loves movies. Not only does it love making them, it also loves showing them. Most any town big enough to command at least two stoplights has a movie theater in it somewhere, or at least did have one at one point. Even tiny towns were former homes of movie houses, and that fondness for films—especially thanks to that big block of winter where staying indoors seems like a great idea—runs throughout Michigan. Cineplexes are a dime a dozen, but let's grab some popcorn and a bucket-sized pop—never soda in Michigan—and check out 10 of the greatest movie theaters in Michigan. The 2015 runner up for Detroit CityVoter's best theater in the area is on the list for a reason. Perhaps the biggest reason is the sheer versatility; this isn't just a movie theater, though the movie theater part of it is about as impressive as it gets. Emagine Royal Oak also boasts event capabilities as well as a luxury bowling facility known as Star Lanes. Throw in two restaurants—the Grille and the Four Story Burger—and you've got a whole day's entertainment. Drive-in movie theaters aren't dead in Michigan; far from it. Coldwater's Capri Drive-In is just one of several examples of the facility still in place, and still operating. While many of these are only open on a seasonal basis—sitting in your car and watching a movie in a Michigan winter could not only be unpleasant but possibly fatal—the Capri holds the distinction of being one of USA Today's 10 Best Drive-Ins in America as of 2001 listings, and has been operating for 52 years. The Riviera in Three Rivers was long known as Three Rivers' only movie theater. It actually continued to show first-run movies up to about 1997—I remember catching “The Postman” there—until a larger multi-screen theater stepped in. Closed for several years, it was recently renovated, and now not only shows movies, but also hosts live events and has its own bar attached, making it a multi-faceted slice of history that's hard to pass up. Ranked as one of Midwest Living's 30 Classic Midwest Movie Theaters, Albion's Bohm Theater represents a little slice of Americana in a familiar yet functional package. From its neon-lit exterior to its special programs—check out Flashback Fridays, showing movies like “Wag the Dog”—and even its live events intermingled into the proceedings, it's easy to see why so many people have a fondness for Albion's historic Bohm Theater. A working movie theater in Charlevoix is something of a feat in its own right, but this comparative newcomer—which got its start in 1996—offers the comparatively small town of Charlevoix a multiplex feel in a small town environment. Showing the latest in Hollywood fare and some indie matter alike, Charlevoix Cinema III offers discount prices every Wednesday, absolutely no ads before showtime, and an owner who records his own listings for phone callers, complete with extra trivia. Another great example of the drive-in, Honor's Cherry Bowl isn't necessarily so great for its up-to-date offerings as it is in its devotion to the time of the height of the experience: the 1950s. The popcorn is popped fresh in a vintage 1953 popper—an antique, essentially—and the theater features not only 1950s style miniature golf, but also a playground, a volleyball net, and vintage memorabilia just about everywhere, making visitors feel as though they stepped back in time. The Cherry Bowl also shows no film rated over PG-13, so for those with youngsters, it's a great stop. A small town favorite, Elk Rapids Cinema in Elk Rapids offers some terrific moviegoing options, but it also boasts what's described as the “world's largest black light ceiling mural.” Offering the look and feel of an old-style movie house—complete with art deco design—with the very latest in digital projection and sound technology, Elk Rapids Cinema is showing us all that even the home theater crowd can have a reason to go to the movies. Winner of the 2015 Best Theater in Mid-Michigan award from WNEM 5, the Vassar Theater in Vassar offers up a pretty solid movie-going experience. Its focus is versatility above all, and it not only offers some really attractive art deco artistry, but it also shows its films in both the classic 35mm film and in HD digital projection. This allows it to offer up an incredible variety in old-style movie house tradition, and that makes it one to watch. It's not the only State Theater out there—it's not even the only one in Michigan—but the Traverse City State Theater does have a unique credit to it: it was named the best theater in the world to catch a movie by the Motion Picture Association of America (MPAA) back in 2013. It was also one of USA Today's “10 Greatest Places to See a Movie in Splendor” in 2012, and that pretty much speaks for the Traverse City State Theater's place here. Throw in some exciting specials—if it's ever 100 degrees outside, you get in free, reports note—and all its credits, and that's enough to sell it. That's the rundown of 10 great movie theaters in Michigan, and we've got them all over. 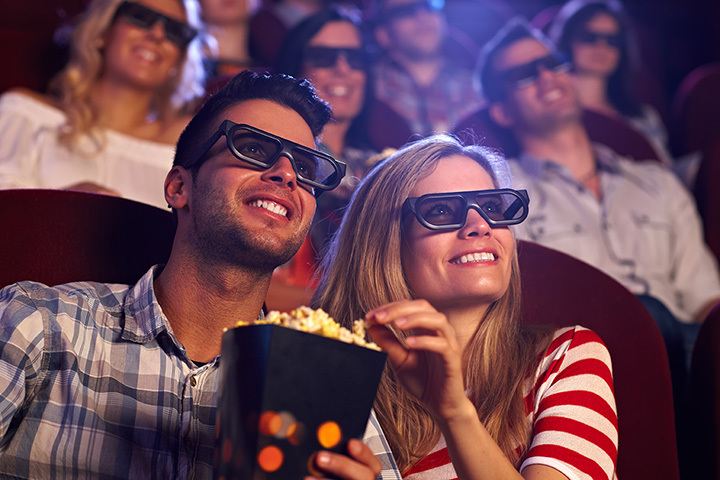 From massive megaplexes complete with the latest in food service and additional attractions to theaters even national magazines rank among the best, watching a movie has never been so accessible. So while the home theater may be compelling, consider making the switch to an actual theater, and checking out what Michigan has to offer when you go to the movies! View more Michigan Movie Theaters.